Once more I'm not sure what the fuss is all about. Volbeat returns with their fourth work Beyond Hell/Above Heaven. To their recognition and burgeoning international appeal Volbeat toured the States with Nightwish and Metallica in 2009 and AC/DC in Europe this year. Their blend of melodic rock, heavy metal, rockabilly, and plain hard rock returns along with Michael Poulsen's definitive and recognizable vocals. While Guitar Gangsters And Cadillac Blood seemed to run together as a confused amalgamation of all those elements without significant impression, Beyond Hell/Above Heaven breaks them out a bit better. The whole rockabilly and metal works on Dollars and Heaven Nor Hell (with the fine mouth harp on the latter). Solid rock emerges on A Warrior's Call with a metal edge. Volbeat brings some authentic thrash overtures on Who They Are. The culmination of Volbeat's genre busting (or confusing) methodology comes on the heavy Evelyn, with Mark 'Barney' Greenway of Napalm Death growling and puking in harmonious contradiction. The song is somewhere between corny and clever, purpose and amusing parody. The funny thing about it? It sounds good. But now we're approaching a sense of Volbeat's charm: the music is so curious, nearly unbelievable, to be both intriguing and entertaining. Tap you toe, bang your head, or simply rock on, it's hard to turn your ears away. Not unlike turning away from viewing a violent traffic accident. Volbeat is quite close to convincing me of their creativity and viability. 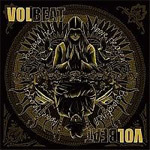 Here's some of Volbeat's charm: the music is so curious, nearly unbelievable, to be both intriguing and entertaining. Tap you toe, bang your head, or simply rock on, it's hard to turn your ears away.